Building a Chevy V8 Bob Gumm's Chevy Engine Building Tips! The bottom end of our 4-bolt main Chevy motor with plenty of massaging here and there! Send me your engine building tips and ideas and I'll post them here! * Some pages require Microsoft Word and Excel v7 for Windows95 ©. My Normally Aspirated Engine This is where the power was made in 1983. An all steel Chevy 4-bolt main 327 bored .030" over, giving 332 cubic inches and about 425 horse power. 1. The Chevy 350 4-Bolt Main 010 Series Block was completely deburred and stress relieved inside and out. Then all oil return holes were radiused to promote quicker oil return. Then the block was milled just enough to true the deck (0.005") and checked for straightness. Deck plates were installed and the block was bored and finish-honed 0.030" over to 4.030". New cam bearings and DORMAN HPX brass freeze plugs were installed. Petcocks were installed in the sides of the block in the water drain holes where pipe plugs normally reside to ease block flushing. All threaded holes were cleaned using a tap to ensure accurate torque readings when assembling the engine. 1. Petcocks installed in water drains on both sides of the block aide in cooling system maintenance. 2. The rare '68 large journal forged steel 327 crank (from a 1968 Chevy C10 pickup truck), 8" steel harmonic balancer, 1969 Camaro flywheel (10.5" clutch-disc type), Chevy Pink rods equipped with SPS rod bolts, TRW forged 11.5:1 pistons, TOTAL SEAL gapless rings, and CLEVITE 77 bearings were all balanced. All weights were recorded for future use, and came in handy when I had to replace a piston, maintaining the balance. 3. To aid in oil control, I tailored a MOROSO p/n 25800 crank scraper to clear the 327 crank and Chevy Pink rods and added a MILODON p/n 32250 Diamond Stripper windage tray mounted to a MILODON p/n 81129 4-bolt main stud kit. The factory V8 oil pan was relieved slightly below the left stud and nut of the second main cap of the windage tray. The lifter valley hosts a few tricks of it's own, a MOROSO p/n 25000 lifter valley screen kit was installed in the four corners to keep broken parts from finding their way to the reciprocating assembly, custom made lifter valley breathers installed in the oil-return holes near each lifter bore, and a MOROSO p/n 25050 lifter valley baffle keeps the hot oil from splashing on the bottom of the intake manifold. A MELLING p/n M55HV hi-volume oil pump was used with a MOROSO p/n 22070 oil pump drive shaft with pinned collar and factory pick-up tack-welded to the oil pump (to prevent loss from vibration). The oil filter adapter bypass was tapped and plugged to force ALL oil through the filter. If you perform the same modification, you MUST use an oil pressure gauge to monitor the oil pressure. A normal pressure at start-up followed by a gradual yet significant reduction in pressure usually indicates the oil-filter is dirty and needs to be replaced. 3. Oil filter adapter with by-pass valve plugged. This is done by removing the retainer, spring and valve, and then tapping the orifice with a pipe tap and then installing a pipe plug. This ensures ALL oil will go through the filter. The oil filter MUST be replaced whenever the oil pressure gauge indicates a drop in pressure. Otherwise the engine will soon destroy itself due to lack of oil. 4. After that I then ported and port matched the 186 casting Chevy heads. Removing unwanted material from between the valve seat and the bowl area, opening and blending deep into the ports to match MR. GASKET 101 intake and exhaust gaskets, as well as unshrouding and polishing the chambers. The heads then were machined to accept screw-in rocker arm studs and Big Block valve springs. Care must be taken when cutting bigger spring pads since the 186 castings are thin in this area. MANLEY pushrod guide plates were then installed. 5. A CRANE cam was used with TRW lifters, MANLEY chromoly pushrods, CRANE double springs, titanium retainers and keepers and Crane Full Roller Rockers with MR. GASKET poly locks. A MR. GASKET chrome 2 piece timing cover hides the TRUE ROLLER dual roller timing set which will soon be replaced by a Pete Jackson timing gear set. 6. A factory V8 Monza oil pan was used and yes it clears the MILODON p/n 32250 Diamond Stripper windage tray just fine although I'm considering replacing the pan with one of higher capacity, probably a MILODON p/n 31070 V8 Vega oil pan. The MILODON pan will clear the long stroke of a small-block 400 or 383 whereas the MOROSO p/n 20230 V8 Vega oil pan won't. 7. 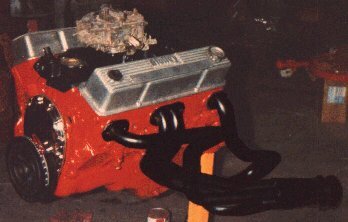 The intake manifold, an EDELBROCK C3B dual-plane was sometimes replaced with a heavily modified Victor Jr. The Edelbrock C3B intake was highly modified to enhance to flow at high RPMs and equipped with a HOLLEY 750 carburetor, homemade aluminum carburetor heat shield, and an AC DELCO 14" by 5" chrome air cleaner. The thermostat housing was a cast-iron factory unit painted white to combat heat, yes it actually made a difference. Without the white paint, the fuel in the float bowls of the carb literally boils. The exhaust gasses exit via a pair of Hedman p/n 68340 V8 Vega headers connected to 2.5 inch pipes. A crossover pipe connects both sides just behind the transmission for an increase in low-end torque, twin mini-turbo mufflers are mounted all the way in the back in the factory muffler location. The mini-turbo mufflers are mounted side by side so that they stand on edge (see figure 7b (Exh-MT1)). The Don Hardy headers cleared everything just fine, but they aim at the rocker panels and the exhaust must be quickly turned back under the car to keep the exhaust system from being visible from beside the car. 7a. Before the EDELBROCK intake and Hedman headers, I used a Corvette L-82 aluminum Q-Jet intake manifold with an 850 CFM Quadrajet and Don Hardy's V8 Vega headers. I made some modifications to the L-82 intake such as port matching, blocking the heat risers, and removing some of the plenum divider. The result was a very responsive wide torque curve which enabled the car to reach 165+ MPH. 7b. 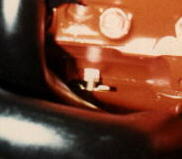 Installing the mini-turbo mufflers on edge allowed them both to fit in the factory muffler location and the rear valance hid most of the mufflers leaving only the dual tips exposed. This was a good sleeper setup as most had no idea what was under the hood and the mini-turbo mufflers kept it relatively quiet until throttled up. 8. The ignition was an MSD-8500 6AL HEI kit that really lights under just about any condition. The factory HEI distributor was also equipped with a MR. GASKET advance curve kit, adjustable vacuum advance, and BLUE STREAK cap and rotor. My plan was to upgrade to a Mallory Unilite BEI distributor. 9. Other components included: MOROSO aluminum water pump and electric water pump drive. MOROSO deep groove aluminum alternator and crank pulleys. HOLLEY polished aluminum valve covers. AC DELCO hi-volume electric marine fuel pump back by the fuel tank and CARTER Z/28 mechanical fuel pump bolted to the block. The engine was mounted via a factory driver's side and passenger's side mount, the driver's side was welded solid. Considering new factory mounts were becoming increasingly impossible to find I decided then to buy new mounts still available from the local GM parts store and make jigs so I could take my old mounts and weld them solid. Once I had the jigs I could make solid mounts that perfectly matched the factory mounts. 10. The drivetrain consists of a Muncie M21 close ratio 4-speed shifted by a HURST Super Shifter III sometimes replaced with a MR. GASKET Vertical Gate (a.k.a. V-Gate) shifter. 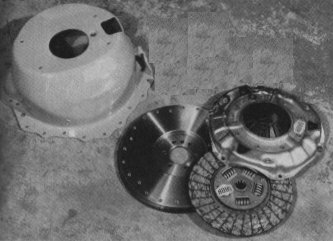 The original clutch and flywheel were replaced with a GM p/n 3791021 1969 Camaoro flywheel and 10.25" clutch, the original bellhousing was replaced by a LAKEWOOD p/n 15000 scattershield customized to accommodate a modified Monza clutch arm and factory clutch cable using a HEDMAN HEDDERS p/n 20130 clutch cable bracket. The clutch arm had to be significantly modified to work in the LAKEWOOD bellhousing. For those who don't have a scattershield, the 10.25" clutch will fit in the factory V8 Monza bellhousing. You don't have to make your own scattershield, LAKEWOOD makes one specifically for the H-Body and uses the stock clutch cable, pivot, bearing, and throw-out arm (available under LAKEWOOD p/n 15010 $409.95 (was $329.95 in 1983). The pilot bushing in the crankshaft was and still is a GM 6.2 diesel roller pilot bearing (much cheaper than the MOROSO unit and it has more roller bearings). The factory 7.5" rear axle housing was equipped with an AUBURN posi-traction out of a 1986 Camaro, COMPETITION ENGINEERING Vega adjustable coil spring traction bars (no longer available), and Chevy S10 axles. I was lucky that my S10 axles which are 1/16" shorter didn't cause my drum brakes to rub on the back dust covers which is actually common for this swap. I was still stuck with 2.29:1 rear gears and hoped to upgrade to lower 3.73:1 RICHMOND gears, at least until I could get my Ford 9" with 5.14 gears and a spool narrowed. However, those 2.29:1 gears facilitated some extremely fast cruising speeds on the highway. I could easily cruise at 135 with little if any stress on the motor. I easily beat a local IROC Camaro known to be capable of 155+mph during a late night highway run. 10. A LAKEWOOD p/n 15000 scattershield bellhousing was modified (added clutch arm pivot stud and nut to passenger side) and bolted on a HEDMAN HEDDERS p/n 20130 clutch cable bracket. I modified a Monza clutch arm for use with this bellhousing. The explosion proof bellhousing would keep my toes and feet intact in case of a flywheel or clutch failure. I've been in a vehicle that had a stock bellhousing when the flywheel exploded. The bellhousing, flywheel, and clutch assembly were all in pieces no bigger than marbles. The floor and the headers were shredded. We were lucky that the previous owner had installed new carpet over the original carpet which combined to serve as a sort of flak vest during the incident. The front passenger was lucky and only got a bruised foot. 11. I rebuilt the engine in 2003. In the plans were stainless valves, bronze valve guides, Pete Jackson gear drive, and dual remote oil filters. I also considered using TORQUE PLUS intake manifold gaskets as I've done some experimentation in this area with a big block Chevy with great results. Things change when you're making plans, see the Supercharged Engine buildup to see what happened.